This weekend was a scheduled play of the revered 1979 game Dune from the same design team as the better known Cosmic Encounter. This well-loved game was recently reworked as Rex, but I’d not played either. No, I’ve not read the books -- my only experience with Dune was the 1948 movie, which I had at least seen a few times. My buddy “Dr. Jim” loves this game and plays it several times a year at the World Boardgaming Championships. He scheduled this event with six of us at his home and acted as a non-playing teacher to help us all learn the game. His adult son and his partner had played before but were in no way experts. We started at 2pm, knowing we’d be in for a long haul. I warned my wife I’d not be home for dinner and packed some snacks. In the rules or not, Jim is a fan of random role selection so I ended up with Atreides. I was familiar with them because Paul from House Atreides was the star of the movie. I started with a decent force of troops on the planet and a cache of spice (aka money). Rick played the Empire and was flush with money as we needed to pay him to buy treachery cards. Russ played the Bene Gesserit and didn’t have any idea what he was doing. Ben was the Fremen, the locals to the planet who seemed to have a few guys all over the planet but were dirt poor. Elizabeth was the Harkonnen and was next to me, well established, in the adjacent stronghold (city). Matt was the space-faring guild and was paid for our ability to add troops to the planet. An interesting twist in the game is that it specifically says in the rules that you are not allowed to take notes, except the Atreides, who are allowed to because of their premonitions. I tried to take some notes but there was enough randomness that it didn’t help that much. Every time the Harkonnens got a card I knew -- they got a free one off the deck so I knew about half of what they had. The other players had a free card so I knew part of what they had. The goal of the game is to have control of three of the five strongholds by the end of a turn to win, or certain conditions after 15 rounds. You could also ally with players and raise the goal to four strongholds between the two of you. 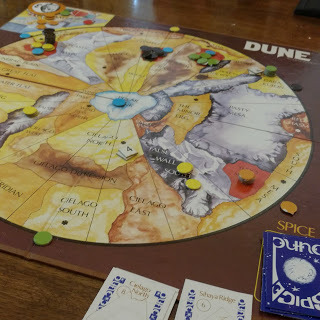 Game play involved a circular map of the world Arrakis with zones of desert where spice would appear, strongholds, and storm-safe mountainous zones. The map was divided into wedges marking of storm zones marking the path of a storm that would move 1-6 spaces around the board every turn. The storm would kill anyone or anything in the desert areas caught in its path. Much of game play was getting in and getting spice and getting out quickly. The giant sandworms would also occasionally appear at spice locations and attack. As seen in the movie, and I assume in the books, there were traitors in the various houses. At the start of the game your house discs are shuffled and distributed and you select a character from someone’s house to be a traitor for you. The Harkonnens, being particularly evil, get four. During combat, these traitors can be revealed by your enemy, making it likely you will lose the combat. Through play, you may obtain traitor cards, which provide weapons and the corresponding defenses to add to the combat value, as well as paying spice to beef up your soldier tokens in the area. Combat was a bit overly complicated and I ended up losing, intentionally at first to trigger my special ability, the later because I didn’t understand it very well. We struggled at first to understand the cost of things, how to do combat, and even the basics of moving. Each turn has several sub steps and we took about 90 minutes to do the first turn with teaching. We eventually got it down to about an hour a turn. The alliances can only be made and broken when the worm cards appear and we really had no idea how or own characters worked, let alone the value of an alliance with someone else, so we passed the first time this came around. I found myself cash strapped most of the game. It costs money to make troops, to have them to move in and out, to get spice, which is money. They often end up dying while out on the board because someone is fighting you for the spice, or the storm kills them, or a worm, so I ended up without money and the troops and needed more money to make more… rinse and repeat. Later, I learned you could fight battles and get spice for winning, but certain cards that players could play negated my spice win, so again I successfully won a battle but lost the outcome I wanted. I was generally confused as to what I should be doing most of the time. We almost thought the game was over on turn two when the Harkonnen/Guild alliance made an aggressive attack, but we fought them off and they were decimated after the loss. We moved on for a few rounds and then someone played a treachery card that blew up the shield wall. This suddenly made the strongholds adjacent to it no longer storm resistant. One was mine, one belonged to the revived Harkonnens. Ben, the Fremen, played his weather control card which allowed him to move the storm ten spaces instead of the random 1-6 spaces. This wiped out of everyone except the Fremen. Russ even pointed out if he moved it a few more segments he could wipe out some of his own pieces. Suddenly it felt like we were starting over except for Ben. He had troops in two cities and four cities, because the shield wall becomes a city now, were wide open for conquest. All of us, desperate to keep Ben from winning, poured troops onto the planet to keep the Fremen from expanding, pouring money into the Guild’s coffers. I was pondering moving into the open city near the now collapsed shield wall, but the storm was approaching it and I feared my new troops would be wiped out on the next turn. After a longer than normal deliberation, and feeling like I was annoying the other players, I finally played to the safe center polar cap thinking I could move in the next turn after the storm moved past. Matt, the Guild, turned to me and verified I was done with my turn. He said -- I’m dropping troops into here, this is my third city -- I think I win. He did. It was amazingly anticlimactic. So would I play it again? If it weren’t for the company, no, but I love a day-long game day with my good friends so... yeah if they did it again I’d go along. There was some chatter between friends after the game and that Rex has streamlined it and Rising Sun is similar and easier to get on the table.